In California’s Central Valley and Southern Sierra, we have three seasons of garden work, and one season of rest. Although most of our California gardens have a much lighter maintenance schedule than the gardens of our grandparents or parents, in order to look their best, there are a few meager chores we want to keep up on. What are the seasons? Autumn, winter, spring. Summer for us and for our plants, is the season of rest. I’m writing this while spring is banging on the office door and telling me to get outside and get some “real work” done. Weeding, especially. Where I live in the Southern Sierra foothills, there are lots of yards upon which gallons of herbicide are used. Those are the ones with a lot of bare dirt and in many cases erosion problems. (See, even weeds are good for some things. Besides erosion-control, they support lady bugs and other native insects and micro-organisms. But that’s another story. ) Those herbicide-heavy yards also have practically no weeds growing about a foot a day, challenging us to knock them down before they can spew thousands of seeds, causing us to use machines that have other environmental consequences in order to control them. I am not the no-herbicide purist I used to be. I practice a common hybrid-program of weed control: a little spraying, a lot of mowing and weed-eating, a little hand-pulling. Like many of my gardener friends, I find hand pulling weeds to be an enjoyable hobby, when I can carve out the time to indulge in it. I imagine there are others who find spraying to be enjoyable. I can’t say I’m one of those, mostly because it’s boring and you don’t see the results right away the way you do when you yank out a long string of Bermuda grass with the rhizome clump attached (yes!) or clear brome (future foxtails) out a bed, leaving only the wild flowers. Like most gardeners, I have a hierarchy of offenders. The chickweed and oxalis (Bermuda buttercup) often get left alone so I can concentrate on the grasses, bur clover and cheeseweed (giant mallow). Time to remove last year’s growth on my desert or Palmer’s mallow – Abutilon palmeri. Another job of spring is pruning back all my late summer and fall-blooming shrubs and perennials. This includes my desert mallow (Abutilon palmeri), which doesn’t like the cold and dies back little by little from November to January or so, depending on the weather. But by April, it is generally re-emerging and it’s time to take off the old stuff. I suppose in its native range or in a warmer garden, it may not die back as much or at all, but in my garden this works great because it keeps the mallow in check. For all these die-back plants, you don’t want to trim off the old stuff too early; the dying and dead stalks help protect the crown from frost. If you freeze the crown, you probably will lose the plant. Other California plants to prune back now are California fuscia (Epilobium/Zauschneria), California goldenrod (Solidago californica) and, if you must, deer grass (Muhlenbergia rigens.) 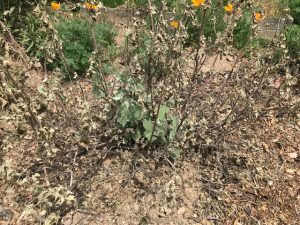 Non-native plants that we often include in California gardens that should be cut back now include autumn sage and its variants like Hot Lips, Lipstick, etc. (Salvia greggii and S. microphylla), Mexican bush sage (Salvia leucantha), lemon marigold (Tagetes lemonii) and Russian sage (Perovskia). You can probably start this pruning in March, but it doesn’t hurt to wait until you see the new growth really shooting forth. Don’t wait too late though; we want to get all this pruning done before it gets hot, which is often the end of May. I am finishing up my irrigation repairs and improvements. Whether you have sprinklers or drip, or a combination, winter and spring are the seasons to make sure your entire system in ready for starting up. Flush those lines, repair or replace broken parts, make sure the controller is functioning (both on and off) and make any efficiency improvements. If you’re not into this or don’t have the time or knowledge, contact me or another qualified service professional to get things fixed up and ready for summer and fall. In between rain storms, it’s glorious fun to get outside and get the landscape in shape for summer. The tools should be sharpened and serviced (winter job), the wide-brimmed hat and sunscreen are on, I even bought new gloves… see you in the garden! Abutilon palmeri, California native plants, Central Valley, gardening in California. Bookmark.